The Delta Queen in Mississippi is considered to be one of the most haunted ships in the United States today. This majestic ship took its first voyage in the year of 1927. 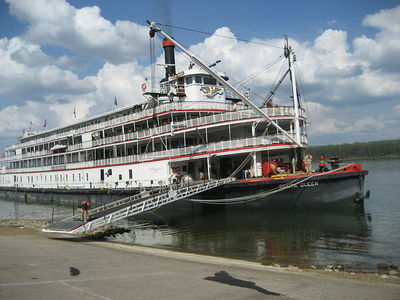 Today, this ship still entertains those that want to travel the Mississippi River, as well as the Ohio River. In her lifetime, this particular American riverboat has hosted quite a bit of paranormal activity. Here, you will learn about some of the unexplained phenomenon that has occurred on this boat, as well as the true ghosts stories that have circulated regarding this most haunted ship. If you are interested in haunted ships, the Delta Queen in Mississippi is sure to appeal to you! Ma Greene played an important role in the establishment of the Delta Queen. She was one of the founders of the Delta Queen Steamboat Company. While she took an avid interest in business, Ma Greene was also named as the first female pilot of such an immense ship. Her name was Mary B. Greene; however, most everyone dubbed her “Ma Greene”. This woman was very much “in tune” to the Delta Queen and took special care to ensure that it was a family friendly place where everyone could enjoy their time. She was also known to hold very strong opinions when it came to the sale of alcohol on her ship. This is something that she definitely did not approve of. In the year of 1949, Ma Greene passed away. While several worked to uphold the legacy of Mary B. Greene and adhere to her wishes, a group decided to set up a saloon shortly after she passed away on the Delta Queen. The first cocktail was served onboard the American Riverboat, and just minutes afterwards, a barge unexpectedly wrecked into the massive ship. When it did, it completely destroyed the saloon. Once they uncovered the barge, the employees of the Delta Queen noticed that the barge was named after Ma Greene – it was called “Captain Mary B” – this was the start of the strange, paranormal events that began to take place with the Delta Queen. The crew firmly believed that this experience was Ma Greene expressing her unhappiness with the saloon. Throughout history, many of individuals have traveled aboard the Delta Queen. These individuals include military personnel, guests, and crew members. Most of these people will attest to the fact that they still feel as if Ma Greene is aboard her beloved water vessel. Many have claimed to have seen an apparition that resembles this lady. While it may seem startling to many individuals at first, most people who have encountered this real ghost know and understand that she is a kind spirit that means no harm at all. While real ghosts are not often a common occurrence, the shock that most people experience when coming in contact with this spirit wears off quickly when they realize how friendly she is, and that she is just overlooking the activities occurring on the Delta Queen.